“Expect Miracles”. That’s been the theme of my last few months. It’s also the tag line of some soap I just purchased. Recently, the rational, grounded me has been replaced with a version of myself that has become interested in quick fixes, silver bullets and magical solutions to all of my problems. On the surface, I know better, but I have found myself approaching my life with a slight hope of accomplishing things the easy way. Enter this soap I just purchased. I have not given much thought to my age, or to my aging. It’s a part of life and I’m generally pretty accepting of the fact that I’m not immune to it. All of a sudden, I’m preoccupied with any physical signs of aging. Maybe it’s because I have entered the last year of my 30’s. Maybe it’s because this new house has a bathroom light that shows every single line on my face. Whatever the cause, I’m more aware of it than I have ever been. A friend of mine caught me perusing the shelves of eye cream at Target and I had to come clean that I was attempting to upgrade from my Dove bar and find something to make me look 25. She told me about a local woman who had just won a product investment on Project Runway for her line of skin care. Her secret ingredient was this ancient oil called sea buckthorn oil that supposedly regenerates skin and is the fountain of youth. This is where I should have gone back to the Dove bar (ancient oil! reverse aging!) but no, she had my attention. The product line was called Swell Skin and lucky for me, it was sold in our local grocery store. I went to the website and everywhere I looked, it said “Expect miracles!”, and like any good product promotion, it had plenty of testimonials stating that a miracle did, in fact, occur. I’d never been so excited to go grocery shopping. I bought the soap and the oil and could not wait to use it. Evening came and I went to bed with the same anticipation that a child does on Christmas – something magical is going to happen overnight. It did not. I continued to use it because despite not looking like I was 25, I actually liked it. But nothing dramatic was happening. About a week later, my husband asked me, “What is that new soap? I’ve been using it and my skin looks so much better.” My husband. My ageless husband who still looks like he’s in college. He’s the one getting a miracle! I just shook my head and went to sleep reminded that miracles don’t happen to middle-aged women. Will someone please just fix my children for me? Seemingly without notice, my adorable boys have turned into quarreling, frustrating, hard to like pre-tweens (is that a thing?). The eleven year old is handing me a serious challenge for my patience as he ramps up his inattention, his inability to listen and his inability to wash anything while in the shower. I need to recalibrate my parenting skills because I am not doing a great job right now. I seriously have to remind myself to hug him everyday. This summer, we signed the boys up for a week of sleep away camp. This was a first for all of us and it seemed like a particularly good idea for the oldest one who needed a vacation. Ok, I needed a vacation. I missed them terribly (really!) but I was hopeful that they were getting a good dose of independence and of good ole’ camp expectations and discipline from their counselors. I was expecting a miracle. We had a movie-moment reunion when we picked them up. Everyone was happy (albeit very dirty) and the boys were overflowing with stories and banter like the two children I always wanted. No sooner did the car door shut, than they were fighting over who was chewing gum too loud. They were back. My husband and I took a deep breath, looked at each other and both admitted that there are no miracles with children. Just time, love and patience. If any miracle was needed, it was for us and our parenting. If you have ever worked at a non-profit, you can sympathize with what the end of a fiscal year feels like. All eyes are on the budget as you count every dollar in the hopes of meeting the goal. I am in fundraising and have recently taken a new job at another local non-profit. The fiscal year was set to end on June 30th and the group had been accustom to expecting miracles. Each year, there would be some heroes at the last minute who would help meet goal. This is not uncommon in non-profits and it’s a cycle that many of us are trying to break. But it’s easier said than done when you so desperately want the organization to thrive and the numbers are stacked against you. It creates a miracle mentality that causes a frantic close to each year. Having never been through the close of a fiscal year at this organization, I felt a part of me buying in to this miracle mentality. We were of course doing everything we could and our team had been doing incredible work all year, but it was evident that we were all hoping for something unexpected to happen. It didn’t. And I’m glad that it didn’t. This organization has the most committed supporters I have ever seen, and by not begging in a hero at the last minute, we were able to truly see what we can improve on and chart the course for the year ahead based on reality, not miracles. My husband and I have always had a family philosophy that you have to work through the discomfort of change if you truly want to appreciate the things you have. No miracles. It needs to feel difficult and uncomfortable in order to bring the personal satisfaction that you are seeking. This perspective has brought us through some very trying times in our life together. I’ve lost sight of that and need to return to more realistic approaches to the things in my life. The miracle is what you learn by putting the work in to create the things in your life that give you fulfillment and happiness, right? That miracle can happen, I’m certain. 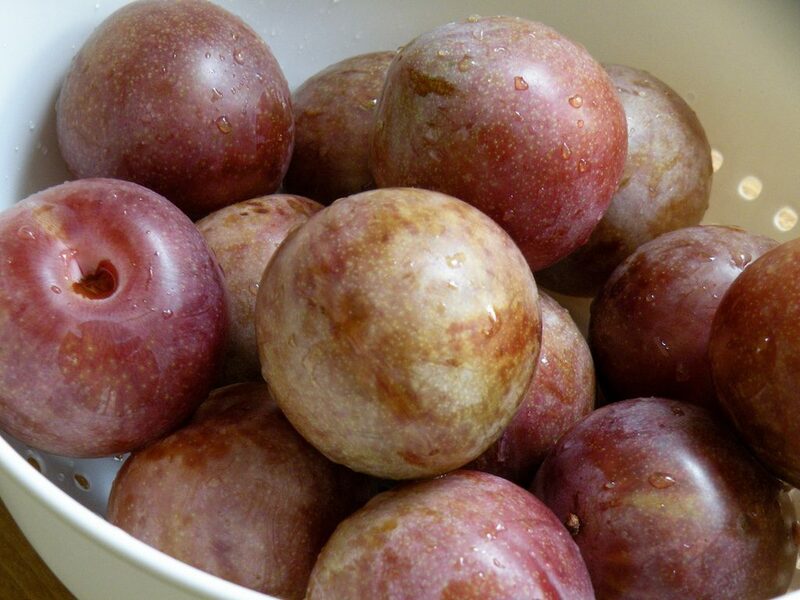 Delicious plums are about to be peppering the markets and produce sections! 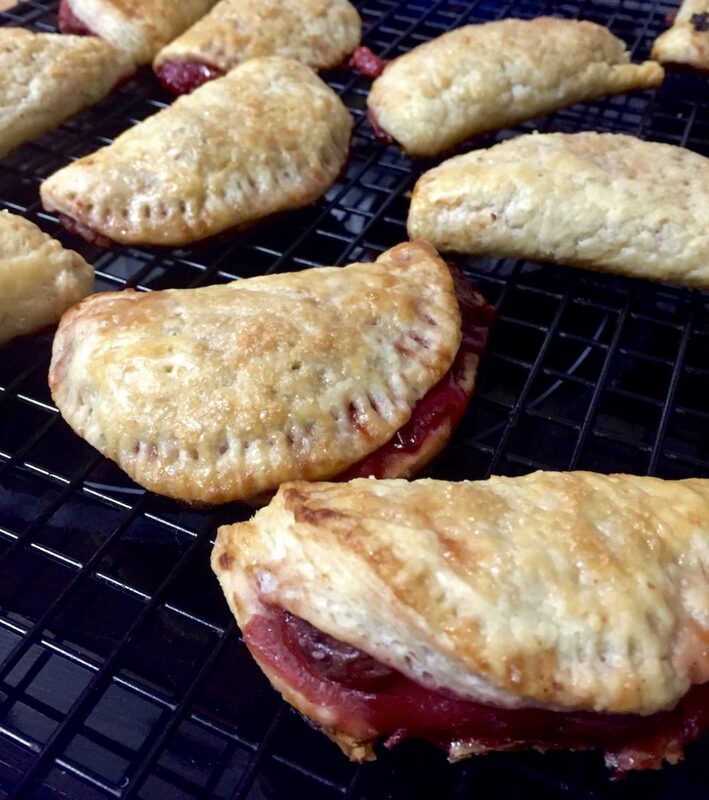 I love putting plums and sour cherries together and this hand pie is my late summer favorite. 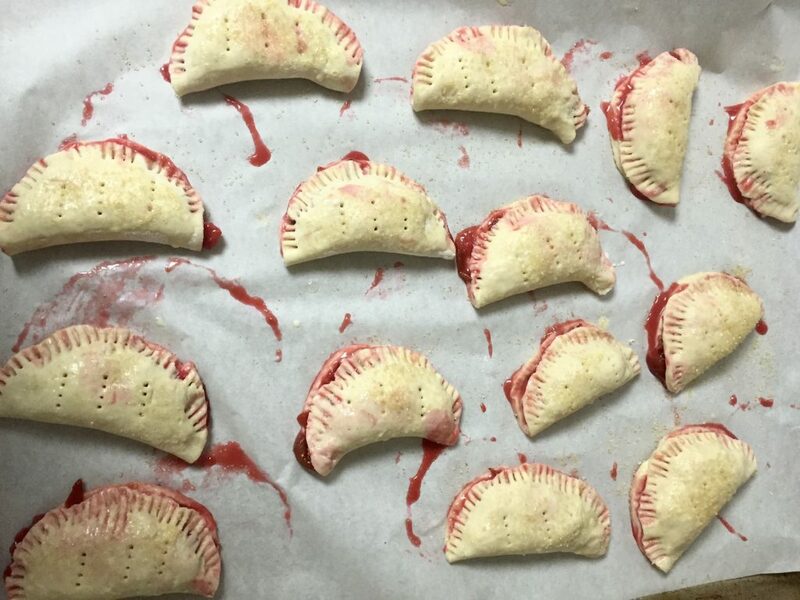 Hand pies take some preparation, but I assure you, it’s worth it! Place dry ingredients in a food processor and pulse a few times to mix. Scatter the butter on top of the dry ingredients and pulse until the mixture begins to look more like cornmeal - very small pieces of butter. Drizzle about half of the water on top of the mixture and pulse a few times to incorporate. The dough is ready when it just starts to come away from the sides and you can pinch it together with your fingers. You may need to take a butter knife and make sure that no pieces of butter are stuck under the blade. Turn dough out into a bowl and form into a ball. Using saran wrap or press-n-seal, press ball into a disc, wrap and refrigerate for at least an hour. When the dough is chilled, roll to about 1/8 inch thickness on a lightly floured surface. Using a 5 inch round cutter (glass, can...anything), cut as many circles as you can from the dough. You will need to roll twice or maybe even a third time, but that's ok.
Place circles on a baking sheet lined with parchment paper and refrigerate. This is a great step to do ahead of time, as the circles will keep in the refrigerator over night. In a small bowl, place cornstarch, the additional 2T of sugar and cinnamon. Mix well. 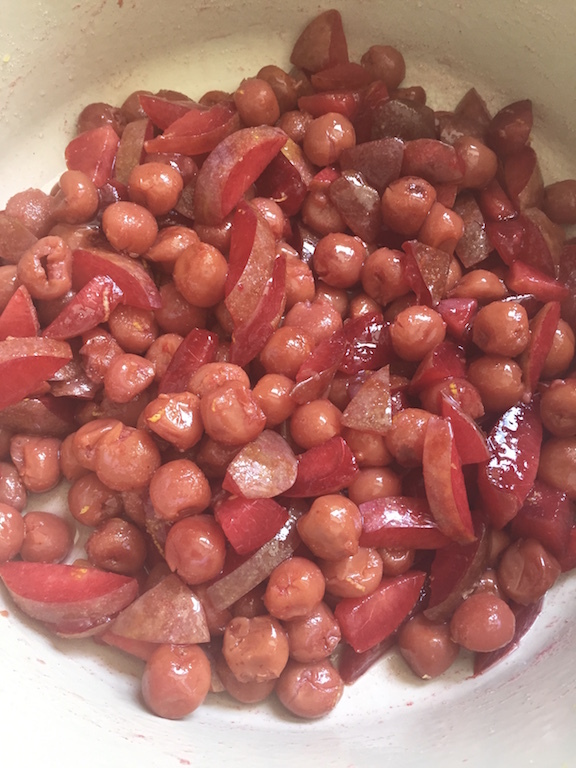 While the dough is chilling, make the filling by cutting the plums into about 1/4-1/2 inch slices and placing with the cherries in a medium pan or skillet on the stove. If you are using sour cherries canned in water, drain well. Add 1 teaspoon of the lemon juice (or a quick squeeze like I do), lemon zest and 1/4 sugar to the mixture. Over low to medium heat, begin to cook the mixture down for about 5 minutes, stirring frequently. 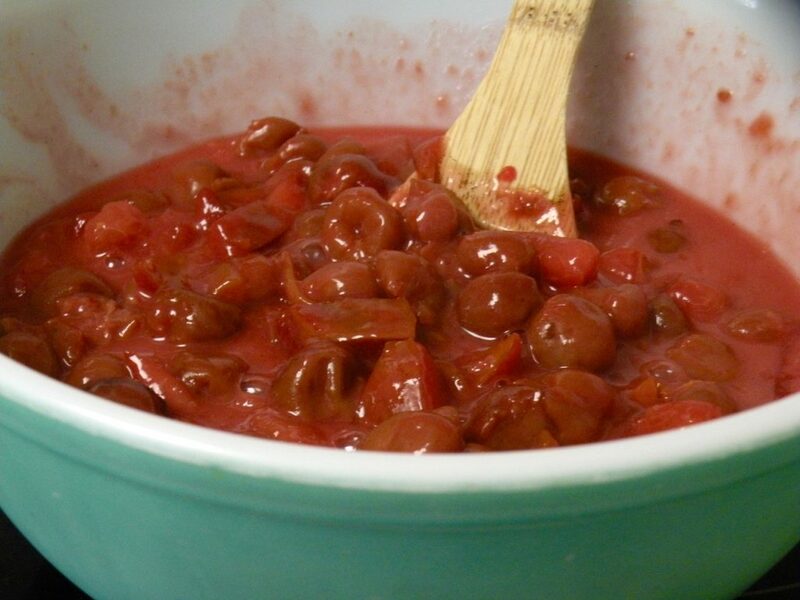 You may have a lot of juice from the cherries and can pour some off while it's cooking. When the fruit is just beginning to soften but still holding shape, add the cornstarch mixture and turn the heat up to medium-high. Stirring constantly, continue to cook for about one minute until the mixture thickens. Place the filling in a bowl, add the other teaspoon of lemon juice and the vanilla. Let the filling come to room temperature before using. This can also be done ahead of time and stored for two days in an air tight container in the refrigerator. When the filling is cool, place about 2T of filling on each circle of dough. I try to put as much filling in as I can. 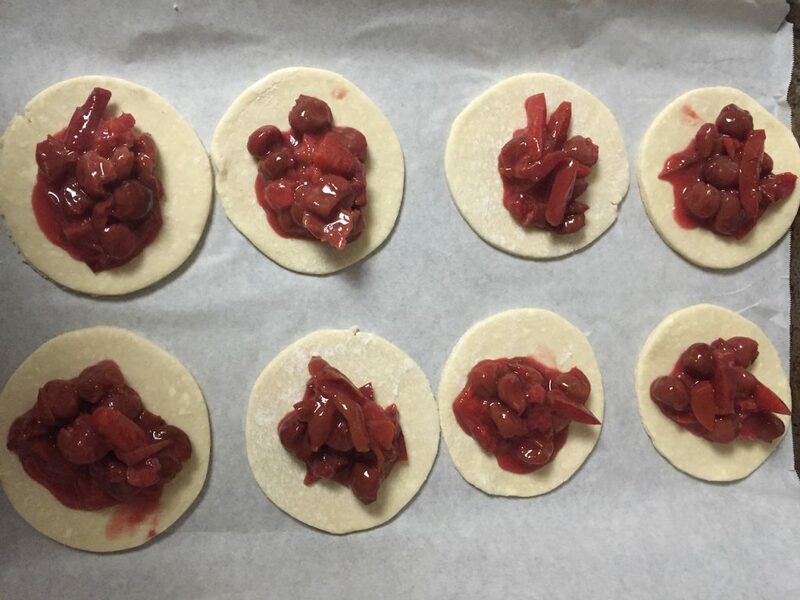 Fold each circle over, and seal the dough using a fork. Return to the refrigerator or freezer for about 10 minutes. When they are chilled again, pierce the top with a fork and brush with milk or an egg wash. Sprinkle with turbinado sugar and bake for 30-35 minutes until brown. Cool on a baking sheet and store lightly covered for up to two days. Enjoy!